Made In Japan is now shipping in all the various editions. We have already gone on about this on the site so will be interested to hear what people say once they actually get to study the content in detail. I’ve opened a reviews page. DTB online stock is going out but taking ages to pack; as seems the norm these days we were left til last for stock orders. However we will hold the advertised prices on the big editions for the next couple of weeks. The Artwoods collection has been revamped since we last posted about it. The set has been given a new title, Steady Gettin’ It, a new sleeve with a great colour photo, and an extra disc! So it has morphed into a triple album. The main reason for this is the inclusion of no fewer than FIVE BBC sessions by the band, some sixteen tracks in total from 1965, 1966 and 1967. The booklet has also been expanded to 38 pages. It’s due in at the very end of July now, so will probably ship early August. Full track list is on our online store. Also from the sixties is a nice looking reissue of the original Zephyr debut album, Tommy Bolin‘s first major studio output. Out of print here for years (BGO first issued it in the UK on CD), this has been overseen and annotated by band member David Givens and includes a remaster of the original 1969 album, a CD of miscellaneous live tracks and a third disc which is a one-off full reunion show from 1973 in Boulder (Tommy had moved on the year before). It’s a US import due at the end of this month but DTB Online will be stocking it. All the CDs are in separate mini-gatefold covers packaged in a nice slipcase with a detailed booklet. Just think, MIJ could have looked like this! 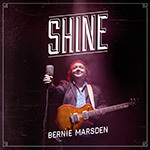 Bernie Marsden has also finally set a date for his much trailed new solo album Shine, which is now due in August. 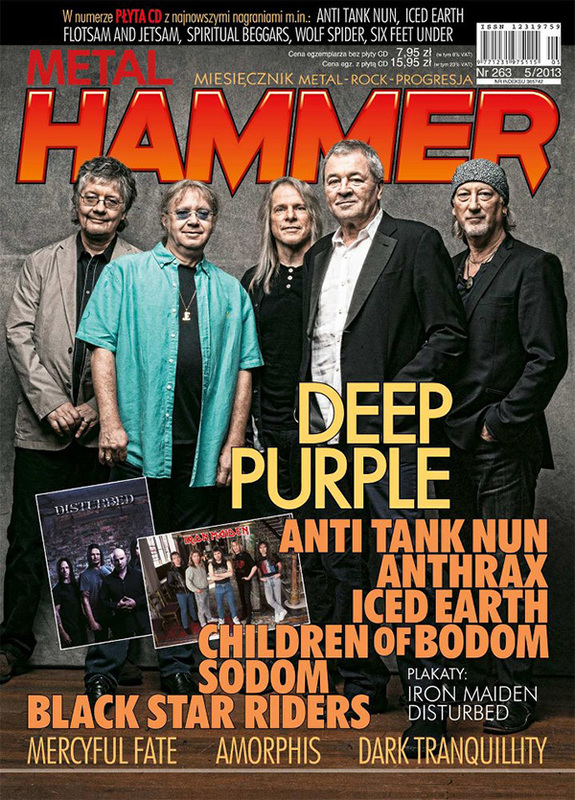 As we’ve mentioned before, this features David Coverdale, Ian Paice and Don Airey in guest roles. The previews we’ve heard sound great, a really gusty blues production. There will be a limited double vinyl run as well. Glenn Hughes‘s new outfit California Breed is also due in a few days. They have added a limited edition which includes a DVD of the promo videos and other goodies. Still no sign of the triple vinyl for Black Masquerade by Rainbow, we’ll keep hammering away at the label reps for a date. The triple vinyl of Deep Purple’s 1969 Concerto has also gone back and is now promised for late June. The Mk 1 box set is still in the pipeline but getting nearer. I’m hoping there will be some exciting news concerning this, but have to keep quiet for now. All the above are on the DTB Online store and can be ordered – or pre-ordered. Lastly we do have some stock of the limited edition Record Store Day Deep Purple releases here but will only put these on the store once we have fulfilled the pre-orders. And talking of online stores, we are in the final testing stages of a NEW DTB COLLECTABLES online shop. Response to our earlier lists of collectors items, rarities, second hand vinyl, etc. was so good we have decided to open a new online shop for this sort of material. More details will follow very shortly. We are also going to open a new email news and new release news service. Lots of you already get emails from Ann but her software is now starting to creak at the sheer number of addresses. So we’ve invested in a special software to organise this better and again details will be posted here soonest. Gillan and Paice looked relaxed on the Later with… TV show on Tuesday evening. Jools Holland banged on about the album sleeve for a bit and then (for some reason) asked IG how dressing room riders had changed over the years? This prompted a nice (but barely audible) IG riff about asking for a rhino full of tartan ice cream and milk from two dogs! Holland then wheeled out the old Top Of The Pops clip – again – and asked them to come back and play on the show sometime. Paice said they would make that happen. IG mentioned that Roger couldn’t come as he was in hospital but didn’t say what was wrong. They may have a longer chat on the show’s repeat. The DTB Mail Order Store have been told the Now What vinyl edition has sold out. The distributors are checking to see if any extra stock about, or if the label might be repressing given the demand. Rolling Stone magazine have run a story asking readers for their list of bands which should be ion the rock and roll hall of fame but are still missing. Deep Purple tops the list. They were nominated for this year, and the next list will be announced in 2014. The place is fast becoming something of a laughing stock. Here’s the story. And even I know how to spell Nirvana correctly. Also worth reading, a really well put together review of the new album and where it sits in the band’s career, in the Albany Democratic Herald. Nice to see such good journalism surviving in odd corners, it sure beats some of the shallow stuff which passes itself off in the UK qualities these days. And when you’re finished reading it you can even get a Beaver Sports Update… A fairly positive review in the Independent newspaper in the UK too although the writer seemed to think that Don was a replacement following Jon’s death. The Wednesday after Jools, Coverdale popped up on the BBC Breakfast TV sofa looking chipper and plugging the tour which starts Saturday. Dates are on the Coverdale news page. There are strong rumours to the effects that Bernie will pop up again at some shows, and even that Micky Moody might join him, but we’ll have to wait and see. It looks as if Coverdale guests on a track on Bernie Marsden’s upcoming solo album, as well as Joe Bonamasa (it is coming out on Joe’s label). Finally who is the scallywag who posted this comment on a YouTube clip of Ritchie and The Outlaws some years ago (hoping it might become part of Blackmore myth)? It has finally been refuted! “Not many people realise that Ritchie Blackmore wrote and played most of the music for children’s television through the 1960’s – this was just before purple made the big time: Magic Roundabout, Chigley and Camberwick Green to name a few.” Mind you two more mid-sixties sessions have been mooted by one of the old engineers, so we’re trying to confirm. Oh, and still wondering why Amazon are so cheap? Staff at their German offices have had to stage a strike just to try and get their wages up to the German state minimum. Thanks to Mark Maddock. John McEvoy. Jamie Woodward. Stephen Clare. Tim Summers. Timothy Campbell. Read the rest of John Tucker’s entertaining chat with the man from Whitesnake on his website here. I nearly got to fisticuffs with two chaps at a Mogwai gig in Nottingham a couple of years ago, who felt it incumbent to talk to each other loudly enough to be heard above what can be a pretty hefty volume from a band which pretty much likes to devour an audience, then stuck to the same chat level during all the nice quiet bits as well. Tossers. So let’s get that petition on you.gov right away John. You can orderBernie’s two solo albums at DTBOnline store. 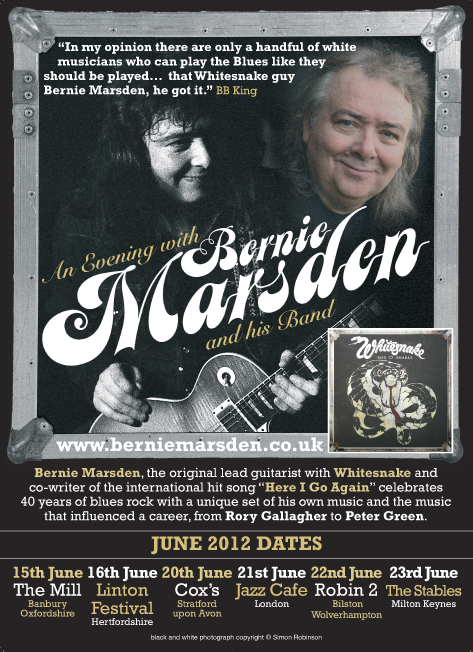 Bernie Marsden is celebrating four decades in rock with a clutch of UK shows this summer, playing his own compositions and material by his faves like Peter Green and Rory Gallagher. Mostly down South but he is making it to the Midlands. Here’s the nice flyer for the tour, with one of my vintage pics on it to boot!